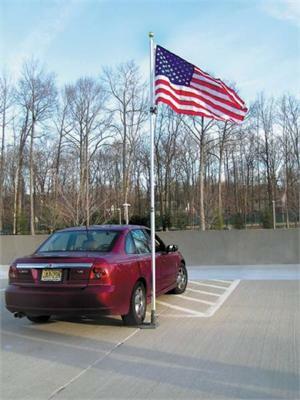 Flagpoles-Suggested-Use: How flags poles are used for different venues and purposes. Flagpoles are used in many different locations and venues, including at home, industry, schools, institutions, stadiums, and commercial malls. They can trucked to location for installation. Once installed, you can proudly fly the United States flag, your individual State flag, or your company, school or organization flag. Flagpoles of various construction styles are available to meet your specific requirements.at an affordable price point. If you have any questions about flagpole products and their appropriate use, give us a call or send an email with your question and requirement. When thinking about your flagpole requirement, rememebr to consider any specific additional needs and reqirements to complete your project. Be sure to arrange for installation itself with a local contractor. Be sure to indicate the size, type of pole, and any information provided for the flag pole to those responsible for installation.